In my house, I have this long hallway gallery wall. I have limited the photos on that wall, to only being B&W, and only being in a black frame or free standing. When Canvaspop wrote me and asked if I would try to print out a photo via their canvas option (they have SO many different things that you can create with your photos). I knew I wanted to add this one photo of Marley and her "I'm going to be trouble" face to my wall. So I chose the perfect photo, turned into B&W and had Canvaspop print it out for me on a 16X20 canvas. It showed up at my doorstep, in record time, packaged finely and ready to join my wall. The quality is impeccable. They're sturdy canvases, and the coloring collaborated super well with the tones from my computer to their printers. Lots of different options when choosing the layout, and before it prints, you'll be contacted to make sure your order is exactly what you were expecting... so no mistakes are made. With the digital age that we live in, printing photos is something that we have lost. We store our photos in our phone, only sharing them on social media, and barely ever create with them. However, now's your chance! 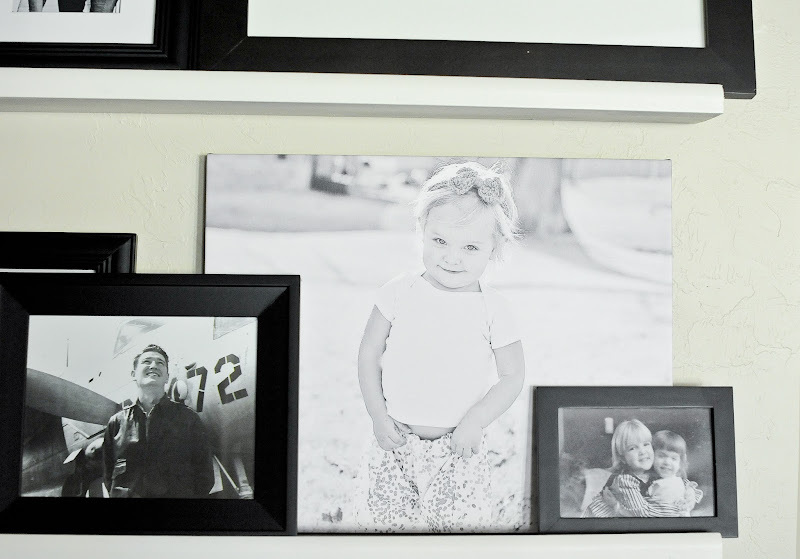 Canvaspop is giving away one 16x20 canvas to one of my lucky readers! To enter, all you need to do is comment on this blog post and describe a favorite photo you have, that you'd turn into a beautiful canvas. Be sure to include your e-mail address. A winner will be chosen and contacted on Friday, June 19th! For those of you that don't want to wait... Canvaspop has so graciously offered an amazing discount code. To receive 35% off your order, use coupon code CELEBRATELIFE35 . Father's Day is just around the corner, and a photo gift is always a fun option. **GIVEAWAY CLOSED** Winner has been notified! Be sure to check out their IG feed, full of fun, fresh ideas and inspiration. Their Facebook page also has some great links and eye candy posts. I have a photo of when Scott was flying in a WW II airplane that I would live in canvas! 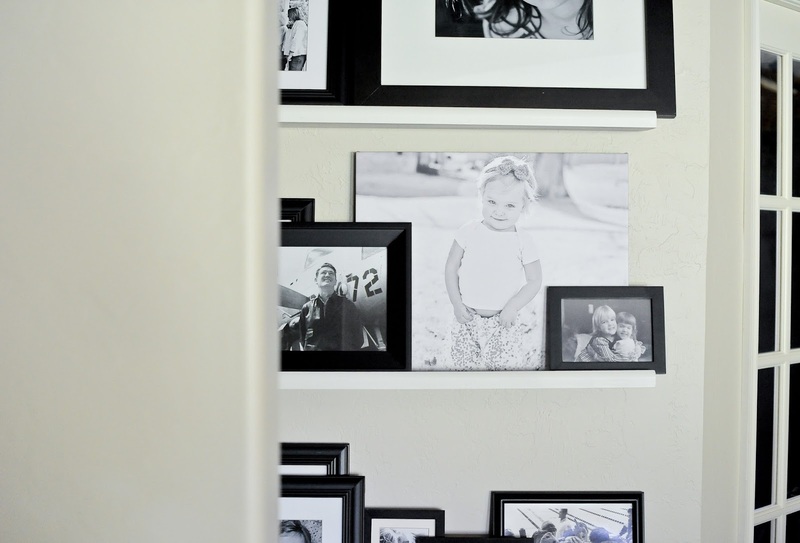 I love your B&W gallery wall! It's both dramatic & eye catching & I think it makes a huge statement. Marley's canvas fits perfectly :) I have been wanting to do a gallery wall in my living room for about, ohh... 2 years. I even went so far as to purchase a bunch of frames, but have since returned them all because my "vision" changed. I'd love to win this giveaway -- I know exactly the image I'd get printed. A picture from our recent trip to Italy, specifically of the colorful row houses on Burano Island. Every corner is picture-perfect on Burano Island, and a 16x20 print would look fabulous on my living room wall :) Thanks for hosting, dear! What a lovely idea. I have several photos I'd love to make into canvas. I'd probably rush out and make a new family one just so I could have one of the family on canvas. Thanks for the great discount code, too. I have a pic of my two kiddos together that would look great on canvas! They are actually smiling and looking at each other. Haha. I sure wish you lived closer so I could have more of your photo skills on my wall. I cherish my photos from Korea. Thanks Karen. From Candy Eker. Email is candy_dylan143(at)yahoo.com. I would probably choose one from the family photo session we just had! I wish I could have you nearby to do a family session! I'd probably choose one of the two kiddos together. :) Your wall is amazing! Hmm. It would be hard to pick but I took a shot of all 5 kids being silly on my bed a few months ago that I'd probably print big :) Love your photo wall- it's inspiration for me once I figure out what I want to print and put up at the new house. I love your photo wall and the pictures of Marley and Fieval! I have been meaning to get a canvas at some point. I am trying to decide between one from a camping trip I had a few years ago, or one that I took of a dear friend of mine. Id have a print made of Cadillac Ranch for my little mans "big boy" room! My daughter is turning one next month and we are having a shoot done with her and a lemonade stand/lemons theme. 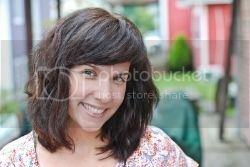 It would be great to have a professional printout of her shoot! I'm not sure if my previous comment actually posted, so I'm sorry if I accidentally posted like 3 comments and they're awaiting moderation! I want to put a 4 generation family photo we had taken onto a canvas print as a surprise for my mom. She'd love it! I have too many photos waiting to be printed, with more to come when baby #3 arrives next month. I have 16 X 20's of both kids as newborns on the wall in the living room/play room and will need to add baby's soon. Love your gallery wall! I have a picture if my hubby + kids from a few months back surrounded by cherry blossoms that id love to have made into a canvas. 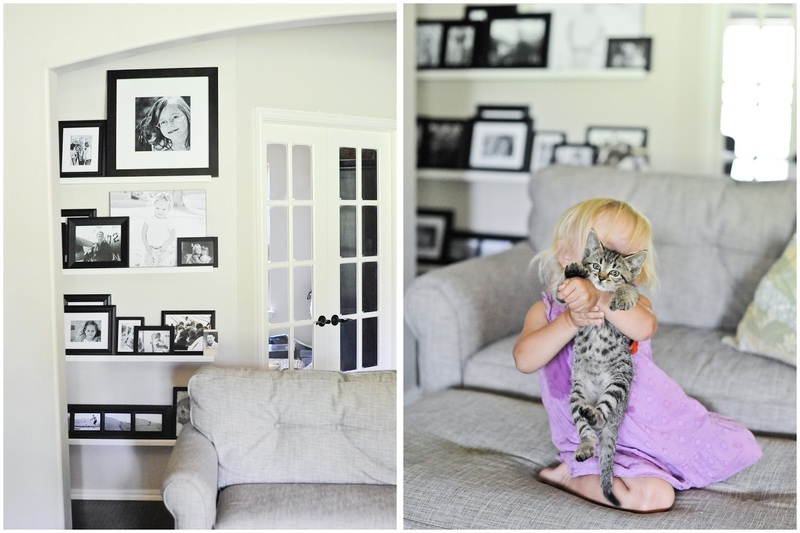 Love your black and white gallery wall! The photo that I would choose would be of my entire family on our upcoming trip to Taiwan!